Under Obama’s budget, individuals would see a net increase of $834.4 billion after new taxes of $931.7 billion offset by $97.3 billion in tax reductions (see table below). The president proposes multiple provisions to increase taxes on high earners by reducing the value of tax expenditures they are able to claim by $598 billion. Additionally, the budget would institute a new “Fair Share Tax,” based on the Buffet Rule, which creates a new minimum tax of 30 percent on high-income earners. It would also raise the estate tax from its current 40 percent to 45 percent and decrease the exemption, for new revenue of $131 billion. It’s important to note that pass-through businesses, which pay taxes through the individual tax code, would likely be hit by some of the tax increases on the individual side of the code, specifically the ones mentioned in this section. 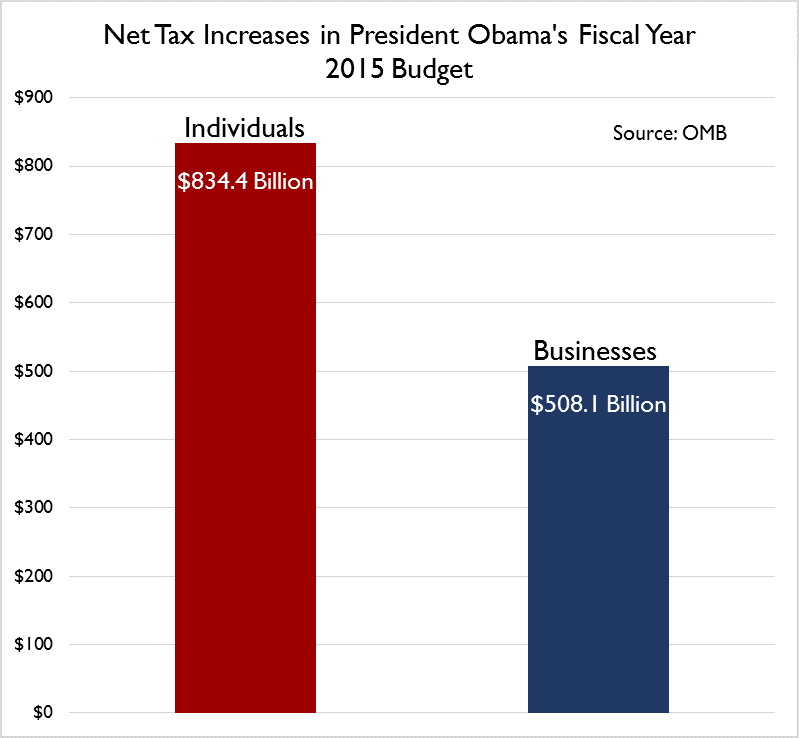 Like individuals, businesses would also see a tax increase under the president’s budget. Businesses would see new taxes of $769.2 billion with offsets of about $261.1 billion in tax decreases (see table below). Many of these decreases come in the form of extending provisions that existed in the 2013 tax code, such as increased expensing for small businesses (Section 179), which saves businesses $56.8 billion, and making permanent the research and development tax credit, which accounts for $108 billion over ten years. The major tax increases come from $276.3 billion in international tax reforms, as well as a retroactive tax increase of $150 billion from deemed repatriation of past foreign earning. The repeal of the last in, first out accounting method also raises $82.7 billion. Implement Buffet Rule through new "Fair Share Tax"
Tax Incentive for Locating Jobs and Business Activity in U.S.
Update: This article was updated with new information. The taxes included in "Reform Treatement of Financial and Insurance Industiry, including Marked to Market" totaling $31 billion were previously excluded. Additionally, carried interest has been moved to the individual tax changes. The tables and chart above reflect these changes.